[1 of 4] I wrote a few posts several years ago before I started my blog…remember MySpace? There are a few I felt were worth bringing over to the blog, so here you go. For 11 years I have been picking up my mail from Jim at Chico Christian Center/A & C Postal Center. This little family owned and operated business deals in bibles, books, Christian music and trinkets, Western Union and mailing services. It’s been convenient to have our mail delivered here so that when we’re on the road, someone is always there to collect our mail and receive shipments. When we’re home, we usually stop by to collect mail and packages on most business days. Today, I went to Jim’s memorial celebration. I’ve cried a lot today, and I remembered that I’m not very good at funerals. I didn’t really know Jim all that well. We shared, mostly, just the quick, casual, hello or some small talk as I waited to sign for a FedEx or UPS delivery. But over the course of time, I saw things, I recognized things, I came to respect this quiet, thoughtful, kind man…and I grew used to him being there. I realized this week that there aren’t many people (besides my wife and kids) that I see most every day. 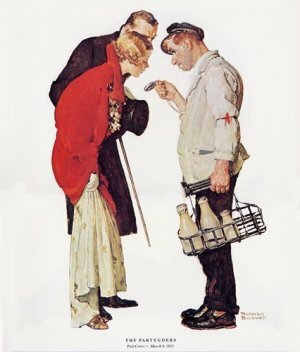 I imagine that this must have been what it was like for people in Norman Rockwell paintings, their relationships with the uniformed Milk Man, or the Mail Man. I assume that in those ‘simpler times’, those ‘seemingly perfect times’, that people always waved to each other, smiled, and appreciated one another more than I probably do with the people coming in and out of my life. Jim’s trademark was this amazingly large, mostly gray, beard. His was the kind of beard that had taken determined work to create. I figure he didn’t just grow this thing, he had cultivated it for many years. My kids always seemed to be tentative with him at first, mostly because I think they were waiting for The Beard to do something, because it appeared to have a great deal of personality. But Jim was a very paced guy with kind eyes, who spoke softly and with a hint of knowing in his tone. He always did his best to remember my kids’ names, and would give them preference over me, making them feel important and noticed. I loved this. I think shockwaves went through our small community a couple years back when Jim shaved The Beard. Probably something you would have overheard being discussed at coffee shops or even in a City Council meeting. As hesitant as my kids had been when The Beard was around, they were even more unnerved by it’s absence. It took several months before we began to see Jim as himself again, instead of the guy without The Beard. I think it’s funny how we build small, seemingly insignificant, friendships over time. I think it’s interesting how people somehow impact my life in small ways without me realizing it. I think it’s sad that I don’t recognize it sooner. During the course of the memorial service at the Presbyterian church, where he had been an elder and sang in the choir, they passed a couple microphones around the crowd for people to share some of their memories of Jim. I was undone by story after story and the fact that this quiet, meek man had drawn a crowd of around 300 people, packing out the sanctuary and choir loft. I had no idea the impact this one man’s life had made. Honestly, I had often wondered how he managed to stay in business. A franchised Christian Bookstore had come to town years earlier, but Jim kept his shop’s doors open. Most of the time, when I would stop by to gather my mail, there rarely seemed to be anyone in his store, but they didn’t close. As I sat there and heard each story of how people had found their way into his store and how he would just simply take time to listen, or help a wanderer find their first bible, or help an Aunt send care packages to her nieces and nephews in the war, I began to understand that this was not just about business, this was a calling, a ministry, one man’s life’s purpose to love others with a love like Jesus…and he had shown love to me along the way. I guess that it’s not uncommon to reflect and look at your own life when you watch someone else’s end. It’s been interesting how over the past month I had already been doing some personal evaluation and observation, asking myself “What is God’s purpose for my life? Am I living to accomplish God’s purpose for my life? And, what am I committed to?” I haven’t necessarily come to any conclusions as of yet. I’m still asking questions. I’m still listening for answers. Grace…an amazing gift from God. Love…something I want to live out the way Jim did. Have you had someone like Jim in your world? Wow! Thanks for that! I want to learn from Jim to live my life like that! Yeah, Jim seemed to teach quiet lessons. Thanks for reading.